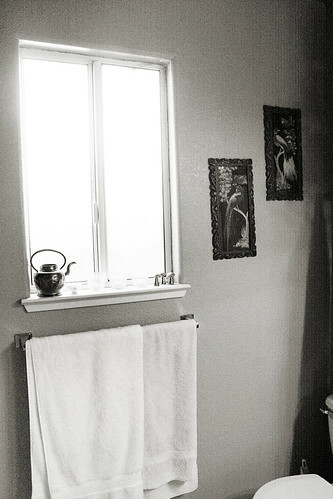 The next stop on our Thrifted Home Tour is the bathroom. Yes, the bathroom. 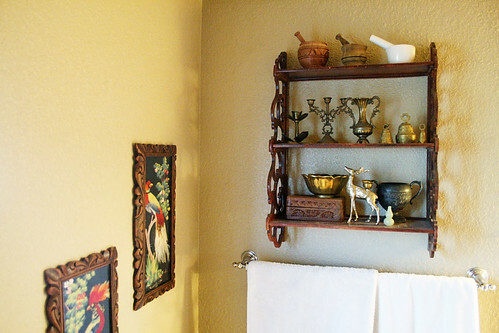 For someone who can’t abide clutter I still want my bathroom to look pretty and I think the best way to go about this is with interesting thrifted décor. 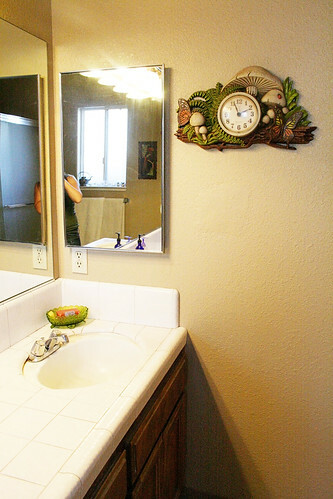 Some of the worst decorating offenses happen in the bathroom. What a wretched fate for such a small space! It’s subject to all manner of hideous themes and poor color choices. I tend to like uncluttered spaces and this is doubly true in the bathroom where space is usually limited and items need frequent cleaning. Less clutter = less cleaning which I can tell you from personal experience is the true meaning of life. The lotion in this picture came from my husband’s cousin Depeche and the candle and brass tray were thrifted. The sand dollar was a present from my friend Melynda. This soap dish was thrifted and repurposed as I’m assuming it’s actually a compote dish. I can’t tell for sure if it had a lid at one point but if it did it’s nowhere to be found. 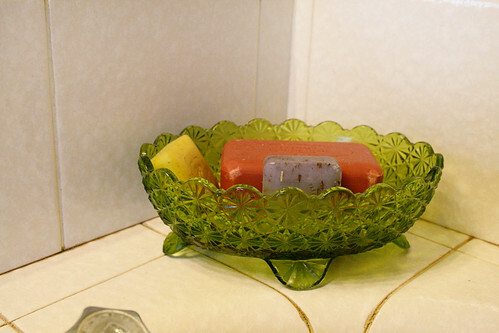 Colorful dishes like this are perfect for holding soap. 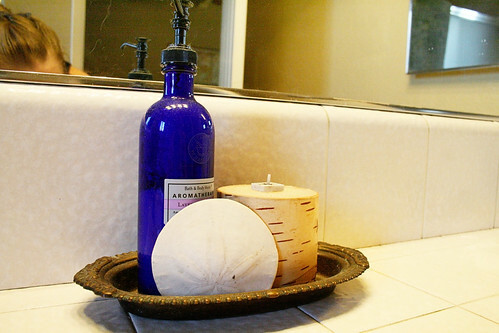 As is true in a kitchen, things in the bathroom need to be both beautiful and useful. This clock is one of my crowning glories. 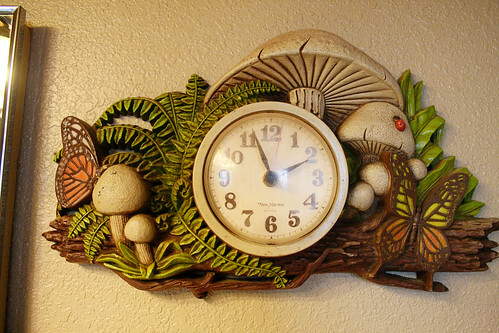 Mushrooms, butterflies, it’s the majesty of the 70s in one lovely time piece. The clock stopped working, unfortunately, so I’m going to take it to see if it can be repaired. Please, baby Picard Jesus. Make it so. The lighting in our bathroom is pretty bad so a few of these photos could only be salvaged by processing them in black and white. But you get the idea. The candle holders, sake cup, and teapot were all thrifted. 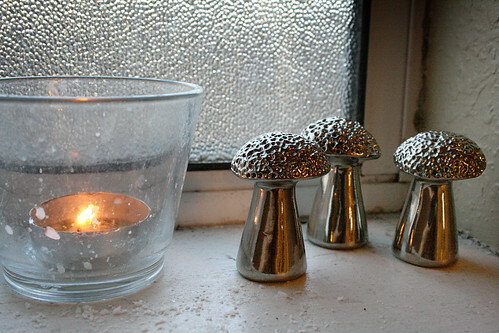 The mushrooms were a birthday gift from Melynda. She sure is generous, isn’t she? One of my favorite finds ever are the handmade, hand painted, Mexican bird paintings. The artwork is a combination of painted design and painstakingly-crafted feathers glued to form the shape of the bird. They were handmade in Juarez a long time ago and they are just lovely. The vintage tin on top of the toilet holds, uh, lady supplies. I bought the wooden shelf while on an epic yard saling adventure with my friends that ended up with us getting stranded in the middle of nowhere, having to push our car around, and waiting for the smarmy tow truck dude. I was secretly pregnant at the time so I took pictures while my friends pushed the car and seemed like a total jackass. But I wasn’t a jackass! I was just pregnant. I suppose it’s possible I was a pregnant jackass. I’m willing to allow for the possibility. Anyway, even though Angela drives a tiny Lancer we somehow fit an amazing amount of yard sale goodness into it, including this wooden shelf. (Angela’s car is actually so tiny I wrote a song about it called, “Hold me closer, tiny Lancer.” I think it’s going to be a hit.) Everything on the shelf was thrifted with the exception of the tiny jade vase, the deer candleholder, a bell, and the white mortal and pestle. Those items are all family heirlooms with the exception of the mortar and pestle, which my bestie Angela gave me. It says, and I’m not kidding, “Coors” on the handle. So! There you have it. 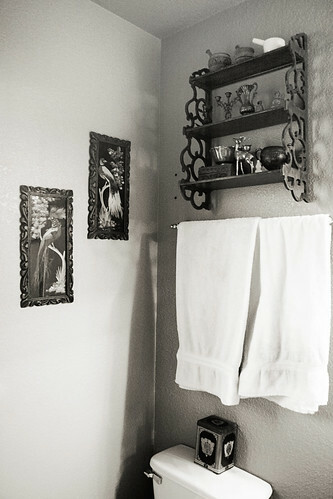 My bathroom at chez Castillo. The main thing I’m trying to get across is that thrifted items can be beautiful, useful, and tell and interesting story. 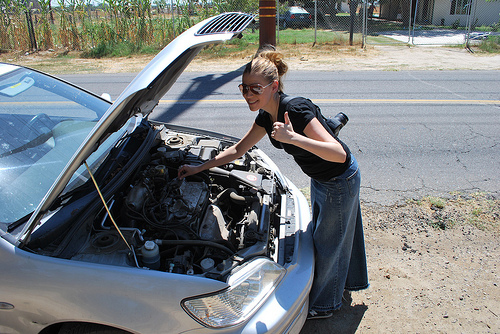 If you find that you need something, look to acquire it second hand before going to a big box store. It’s kinder on the environment, more interesting, and often cheaper. While you’re at it, stop by my shop. I’d be happy to take requests for anything particular you want me to keep my eye out for. This post is part III in my multi-part series called the Thrifted Home Tour. I am showing off different rooms of my house to display how thrifted items can be worked into the décor to be useful and inspiring items. Partially it’s because I’d love to promote my vintage Etsy shop, and partially because that’s just how I roll. You can find part I here and part II here. Thank you so much! I’m so glad you commented. I love hearing from new readers. Hey, I bet there are KILLER thrift stores in Stockton. If you find any let me know and I’ll make the pilgrimage. Also, congratulations on your engagement! Thank you so much! :D I am so excited about it! I’ve totally seen that clock somewhere before! I can’t quite recall where (must have been a family member or friend of family), but it is lovely. 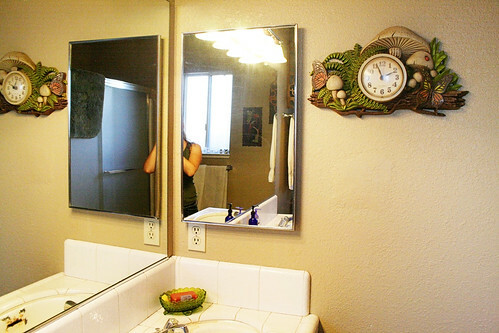 Oh great, I was totally striving for a Southwestern aura in my bathroom but now I see it’s not cool. Back to the drawing board. But seriously, when you come to organize my toys you can also organize my bathroom. ‘K thanks! I would totally do that for you. I’m praying to BPJ along with you so that your clock gets fixed and time can once again resume from the 1970s. It’ll be just like LOST only we’re not on an island (well, OK, I am but there are no polar bears). Time will be much funkier if this clock will work. 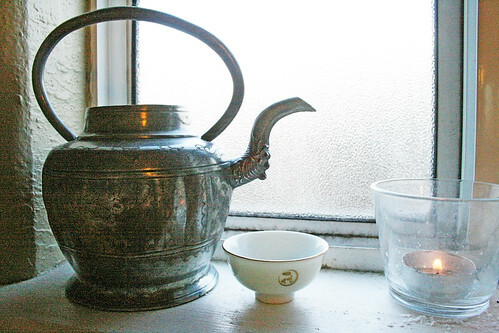 Forgot to say I covet that teapot. Where is it from? Apparently I’ve never mentioned my tea paraphenalia fetish. I feel a photo sesh coming on. How did I not know that you and I are both seventies mushroom decor enthusiasts?! That clock? Best thing EVER. Your house is amazing and I want to live in it. Tricia recently posted..the bar at casa de miller: open all night.